Happy Sunday! I want to wish all the moms out there a very Happy Mother’s Day! All of you have the hardest job in the world. Thank you for raising kind, compassionate and independent children. God knows the world can use more of those people in the world! I also just want to give a special shoutout to my #motherrunner mama, Cheryl! We just came back from a very filling brunch at the Cheesecake Factory and I’m currently writing this blog in a semi food coma. If I had to use one word to describe week 8 of training it would be “blah”. I just wasn’t really feeling any workouts at all this week. I even skipped one of my runs. I usually like to recharge during the taper period but that didn’t happen this week. I completed my last long run on Saturday so that was the silver lining out of the week. As I mentioned earlier, this week was just very “blah”. I can’t really put my finger on it, but I was totally uninspired to workout. I didn’t even post on Instagram all week and that’s rare for me! I basically forced myself to do my workouts and I rarely ever feel like this. Even when I’m tired and sore, I still enjoy working out. I don’t know why I wasn’t feeling it this week. Maybe I’m just over the whole training process for races? I have been “in-training” since Christmas so I am looking forward to taking a break for traditional half marathon training after my races next weekend (my next race is RnR Chicago in late July). I would say the highlight of the week was my last long run on Saturday morning. The weather was very cloudy and it looked like it could rain at any minute so I took my long run to the treadmill for 8 miles. I have noticed some tightness in my right calf during my runs. I have been using my foam roller on it a lot this weekend and will continue to use it next week. I’m hoping it will help to alleviate some of that tightness. My allergies were bad, but much better than last week so I was very happy about that. We got a lot of rain so I think that may have help wash some of the pollen away, hopefully! Have you ever felt “blah”? What things do you do to motivate yourself to workout? I was blah and unmotivated all week too! No clue why! I’m hoping it’ll pass and I can blame the gloomy weather and no running plan. Crossing my fingers that this week you feel inspired again! Hmm…maybe it was just one of those weeks?! I hope we both get our mojo back soon! Great job pushing through this week! I’m sure you’ll be out of the blahs soon! Ugh i hate those days. Usually I can deal with just a day of that but dealing with a whole week of it was kind of crazy! Hoping to get my mojo back this week! I definitely had some blahs weeks last month and it helped to back off a bit. Im glad your allergies are doing better! I sneezed a bunch after my run yesterday and Im hoping my allergies aren’t starting up. Ohh I hope that your allergies are not acting up! I know that you said they weren’t bothering you last week so let’s hope it stays that way! You are absolutely right, you have been in training for a very long time. Maybe your body just needs a little rest. I hope next week goes better for you. P.S, we all have those weeks once in a while! That’s what I’m thinking. I think my body just needs a break from my standard training routine. I felt blah this week too. This is the first race beyond a 10k I’ve done in years, and part of me wants to be done. I know I’m going to enjoy the race, but doing a 10k would two less weeks of training. I totally understand. The race is the fun part but the training can get a little tiresome sometimes. Oh yes, I’ve been feeling rather blah about workouts lately, too. Although I did get in some really awesome runs this week, and by celebrating mother’s day yesterday, I got to run outside all week (cause yesterday was a really yucky cold rain for much of the day). I hope you start to get excited this week! Just think of everyone you’re going to meet in Cleveland! Yes the rain this weekend was so crappy, especially for Mother’s Day 🙁 Hopefully this weeks weather will be a little better! I’m very excited to go to Cleveland this weekend! I think the sudden heat and humidity are taking a toll. I know we were just complaining about the cold, but these drastic changes are rough! 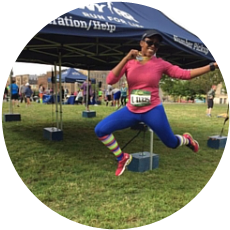 Hopefully you will find your mojo for your race! The drastic change in the weather really did a number on my seasonal allergies. I was miserable last week but a little better this week. i think I’ll get my mojo back soon since I’m very much looking forward to race weekend! I think we all go through blah phases. It’s just hard to be blah when everyone is posting how they “killed” their runs, etc. I hope this week is better for you! You and your mom look so much alike! Exactly. I think that’s why I didn’t post on IG at all last week even though I was still on their liking pictures and commenting on posts. Retail therapy is a great idea..I do need some new shoes for work! I will tell my mom that you wished her a Happy Mother’s Day. I keep telling her to start a blog! It’s smart to listen to your body- the cumulative fatigue is real! Definitely! I think my body is just craving a break from structured workouts and that’s A-OK! Thanks so much for the kind words about me and my mom. Although we both just got into running about 4-5 years ago, we really do enjoy it and it’s a great way to stay active. I’ve been blah for the last two weeks. I actually didn’t run at all this weekend which is super rare for me. I just really wanted to sleep and be lazy! I don’t ever really get to do that on weekends so I figured why not this weekend? Sometimes I think we need a break from our normal routine to feel energized, so hopefully that is what is happening to both of us! Happy Mother’s Day to Supermom Cheryl! I can relate to feeling blah sometimes. I think it’s A-OK to pull back a bit. You’ve been at it for a looong time. Missing a run won’t hurt. I will tell her that you wished her a Happy Mother’s Day! She’ll love the Supermom part, lol. I agree – I’ve been training for almost half a year – time for a little break! Feeling sick, long stretches of training, and tapering all make me feel blah, so I definitely get where you’re coming from! Skipping a run at this point won’t really impact your fitness. That is so cool that you and your mom share a love of running – I would love to be just like her if I ever have kids! You and your mum look so similar. Strong, beautiful women. My goal this year is to get my mum running… or at least walking! Sorry about the blah week – I had one a few weeks ago. Didn’t get much done at all but I suspect it was just a bit of fatigue from all the training. So hang in there, you are soon done with this training cycle! Awwe you are so sweet – thanks so much! I hope that you are able to get your mom to start walking. I think your blah feeling was probably from fatigue – you’ve been training so hard! Glad your allergies are doing better! It’s weird, I feel like my allergies are worse during the rain but they definitely feel better afterward. I feel like my allergies are worst on the super hot days, but I can understand why yours feel worse during the rain, especially if you have sinus pressure. It’s wonderful you get to share so much, including running, with your Mom! I’ve really had to dig deep these last few weeks of training! I am so looking forward to a break. I think the heat has something to do with it. You’ve been in training mode for a long time. I’m sure after a little break, you’ll feel more like yourself. I’ve considered doing RnR Chicago — but the HEAT! Ugh. Thanks for linking! I agree! We really enjoy running and doing racecations together. I am SO impressed by your marathon training, especially in the heat! I have no doubt that you’ll have a great marathon experience in a few weeks. You should totally do RnR Chicago! A bunch of us are doing it this year! ugh! my allergies have been terrible the last few days too. When I feel blah and I’ve felt like that for a couple of days, I give myself a little bit of tough love. I usually allow one or two blah days and then if I keep feeling that way and have no particular reason to feel that way, I remind myself that I’ll feel much better about myself and about everything else after a workout. Usually, that works. When it doesn’t I think of all my goals and get myself going. Sometimes tough love is what we need. I think the drastic change in weather really affected my allergies over the past week. I’m hoping that it will get much better very soon! I like your idea of thinking about goals to get out of that “blah” feeling. I will definitely keep that in my mind if I every feel that way again. We all get our “blah” moments. Mine lasted for several months. But, now I”m back to the routine of things. The heat could have something to do with it? I’m glad that you are back to a routine now – that’s awesome! My allergies have been really out of whack the past 2 weeks so that might be attributing to my blah feeling as well. Ob my goodness yes, I definitely feel the blahs over here sometimes! You had a great week despite the way you felt! Thanks Karen! I’m hoping that the blah feeling is far behind me now! I’ve been dealing with a tight calf myself! When I feel “blah” and don’t want to workout, I’ll allow a rest day (or two if I’m hurting or sick); but if it’s mental, I try to change it up (take a dance class o take a yoga class) and I remember how quickly my body de-conditions when I don’t run or lift. I’ve done so much foam rolling on my right calf muscle. Thankfully it felt better today! I think that after my half marathon I’ll change up my workout routine which may help with this blah feeling! I have felt really “blah” lately about running as well. I’m enjoying my log runs now but everything else is just blah or not fun. Maybe after this weekend half, I’ll have less blah! I agree! You might feel better after your half this weekend. I’m hoping that is the case for me too! I’ve been blah all winter. I’m just glad it’s finally nice out! And I can’t wait to meet you! Oh, the blahs are real for sure. They hit most when my running group isn’t able to join in on runs or if I’m running alone or the weather stinks or many other things. I just have to remind myself that this, too, shall pass, and then I’m good to go. You’ll get it next week! You are still doing so great! Thanks for the great advice Jenn. I’m feeling a little better this week thankfully! You and your mom are the cutest! I love that you run together. Thanks Debbie! It’s so much fun! “Blah” was me over the weekend too! I worked a 24hr shift on Saturday and even managed to squeeze in a couple hours of sleep but ended up still feeling super exhausted. Maybe it’s just one of those weeks? Great job on getting those workouts in anyway! wow a 24 hour shift?! That sounds intense!! I totally get it, Kim. I think maybe it has something to do with constantly being in a training cycle. I’m not totally recommending not training (haha) but I have to say that when I’m just running and not specifically training for something I do tend to like running more. And I’m enjoying my workouts more. So maybe it’s just a funk. You are a very active sporty person, but you are also human and allowed to feel blah. Hopefully that will go away soon. Can you do and do something that gives you a bit of energy, a bit of a kick again? How about your spinning class? Very true. After my half marathon on Sunday, I’ll have a few weeks where I can “run just to run” which should be nice! I’m looking forward to changing up my workouts a bit while I’m not training. Definitely know how it feels to be blah! The winter was tough for a while with marathon training…but as you know, the funk is only temporary! I think once you finish your race and get out of non-training mode, working out will feel like less of a chore! That’s true – it was definitely a long winter! Luckily this week I’m feeling a little bit better. My motivation ebbs and flows. Don’t beat yourself up. You will get back into the swing of things in no time. Thanks Andrea. This week is going better so far! Another great week of training for you Kim and I love all the pictures with your Mom …it’s so cool that you guys can run together!! I went through a period a couple of weeks ago of not wanting to work out. Hopefully you’ll get your mojo back soon! Thanks Kathryn! I feel like I’m getting my mojo back.